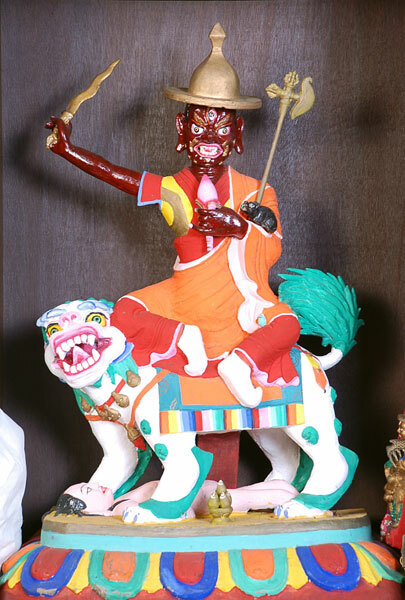 The holy Dorje Shugden statue that once belonged to Lama Yeshe and it was placed in Kopan Monastery all the time, Lama Yeshe prayed to Dorje Shugden till the end, he never gave up his commitments to his Guru. After Lama Yeshe passed away, Kopan Monastery gave away this statue to Tsawa Pulthok Rinpoche (from Drepung Loseling Monastery) in Nepal. 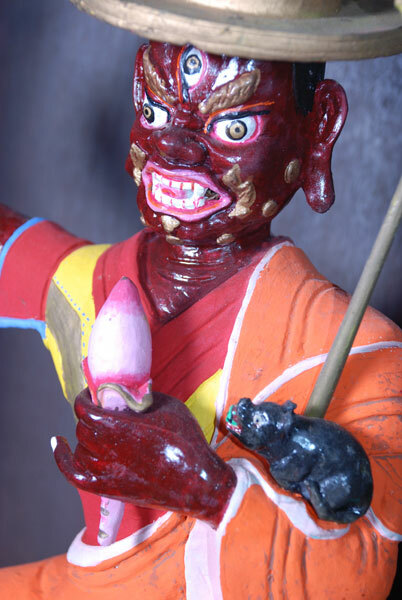 Before Tsawa Pulthok Rinpoche passed away in 2008, he gave this statue to Gangchen Ladrang, Nepal. This holy statue is being propitiated in Gangchen Ladrang ever since. This entry was posted on Wednesday, June 10th, 2009 at 6:01 am	and is filed under Featured, News. You can follow any responses to this entry through the RSS 2.0 feed. You can leave a response, or trackback from your own site. Extraordinary statue! Unlike so many holy objects desecrated by the followers of the Dalai Lama’s campaign against the Deity, this one has been saved. It’s so fortunate that this precious relic from Lama Yeshe’s time is now in the hands of the great Ganchen Rinpoche. Very beautiful art statue. I have never known of Dorje Shugden practice in Nepal. This is wonderful. Thankyou. This DOrje Shugden image is very beautiful! It is an honor to see one of the most original forms of our beloved Dorje Shugden! Despite all the efforts to eliminate him from Tibetan Buddhism, both his intangible (practice and belief in him) and tangible (this very image) has survived and grown. This situation reflects the power of Dorje Shugden. I also agree that “If Kopan Monastery were to revive Dorje Shugden practice again, their Maitreya Project will surely manifest” because I refer to all other Dharma organizations who practice Dorje Shugden openly: they are prospering so much and their reach is so vast and wide, bringing Buddhadharma to so many sentient beings. I pray that more will rely on Dorje Shugden so that Dharma will spread swiftly and smoothly all over the world. May the holy Dharma remain free from political pollution. May all Shugden pratictioners be free to practice. May the holy Dharma and it’s Protector flourish for evermore. Great projects need great protectors. It is unfortunate that the Maitreya Project, which was under the direction of Lama Zopa Rinpoche, has been interrupted. I have read the brochures explaining the progress of the project from conception up to the stage of preliminary architectural drawings. The magnificent bronze statue was supposed to be 152.4 metres tall (500 feet). Surrounding the statue would be beautiful gardens, playgrounds, animal sanctuaries, ponds, fountains and statues of other deities. It was supposed to be the foremost place of pilgrimage for Buddhists around the world. When Lama Yeshe was alive the Dorje Shugden that belongeed to him was well kept and placed in the Monastery in Kopan. And when there was big issue that has arisen regarding the practice of Dorje Shugden. The statue was then given to Tsawa Pulthok Rinpoche from Drepung Monastery in Nepal. Before Pulthok Rinpoche passed away he gave it to Gangchen Ladrang in Nepal and was there until now. Its so sad Kopan Monastery should have kept the statue and prayed to Dorje Shugden. Their Maitreya Project would have manifested if they have kept the statue and perpetuated Dorje Shugden. At least the statue is now safe in Gangchen Ladrang and not dispose of. It can benefit Gangchen Ladrang in Nepal.